Many people get anger. Wash the apple with lukewarm water. Put 40 cloves in it and keep it in refrigerator. Remove the 40 cloves when apple becomes rot. Chew this clove with empty stomach in morning and before bed at night. It will impact on body and mind. Eat one apple daily. This will reduce anger. Take water in silver glass and mix 2-3 drops of kevada juice. Sit down and drink this water. Do this remedy with patient for several months. The Adrenaline hormone remains in the body for 18 hours due to more or high anger. The anxiety increases due to Adrenaline hormone. The problem of body increases due to anger. The body becomes weak due to anger. 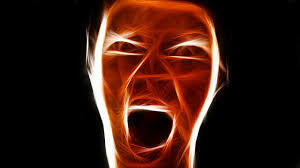 Liver, kidney, heart and blood pressure problem arise due to anger. Anger might give diabetes. Such people get anger due to weak Mars, Mercury and Rahu. A person does anger in arrogance when Sun is impaired. Because of Mars, the person lives in arrogance and anger. The anger increases due to Mars that family leave that person. Mercury ends friendship. The entire life passes in anger due to Rahu. Anger affects business, politics and social prestige. Anger reduces age. Family starts to lose due to anger. People dislike you due to anger. Drink mixture of honey with basil leaves juice in one glass. This reduces anger and irritability. One will get discretion. Try to sit in meditation for a while. Sit for a while closing eyes. Anger reduces when our mind is strong. Neuron and electromagnetic activity becomes strong. The nature and personality changes due to disturbance in balance. Eat one teaspoon gulkand after one hour of meal. Drink milk after one minute of having gulkand. Do not eat food when you get anger. It is like to eat poison when you eat food during anger. This creates bile and other health problem. One should eat food once mind become calm. Do not work in anxiety when you get anger. Chew properly when you get anger. One should complete his work in planned way when they get anger. Expectations are responsible for anger therefore, never keep expectations. We should learn to compromise in life. One face insomnia, diabetes and liver problem due to anger. Chant “Om Shanti Shanti Shanti Om” psalm.